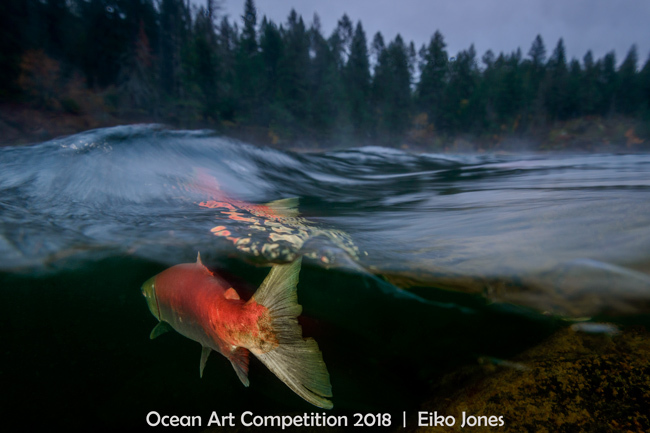 "Foggy Morning on the Adams River"
The Story: A lone Sockeye Salmon swims by as wisps of fog cling to the surface in the early dawn hours on the Adams River. I had scoped this location out during the last dominant sockeye run in 2014. Four years on, during the next big run this last October, I spent a couple hours each day at dawn lying in the dark water. I exposed this image using a relatively slow shutter speed to soften the flowing waters surface, while employing strobes to get a sharply lit image of the salmon as it swam by. Pacific salmon all return to the rivers they came from, only once in their lives, to spawn. At the end of this epic migration up river they pass their genes on to the next generation and then die. It is such an honor to witness and photograph his spectacle of nature. Equipment Used: Nikon D800e, Aquatica Housing, Nikon 16-35mm Lens, Dual Sea & Sea YS-D1 Strobes.